Our complete line of bulk foodservice Chicken soups help maintain our status as the restaurant supply superstore. We strive to carry every different type of Chicken soup available for restaurants and foodservice companies to serve ala carte or to use as bases in making delicious specialty dishes. Choose from cream of chicken soup, chicken noodle soup, chicken broth soup, chicken and rice soup and even condensed chicken soup from Campbells, Heinz and custom culinary. There is nothing like a warm chicken soup on a cold winter day. Campbell's At Hand Chicken With Mini Noodles Soup 10.75 Oz. Campbell's At Hand Creamy Chicken Ready To Serve Soup 10.75 Oz. Campbell's Chunky Chicken With Dumpling Microwavable Soup 15.25 Oz. Campbell's Cream Of Chicken Soup 10.75 Oz. Campbell's Chicken and Noodles Bowl Soup Red and White 15.4 Oz. 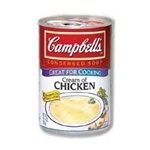 Campbell's Chicken With Rice Condensed Soup 50 Oz. Campbell's Healthy Request Cream Chicken Soup 50 Oz. 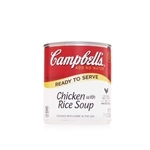 Campbell's Ready To Serve Easy Open Chicken With Rice Soup 7.25 Oz. 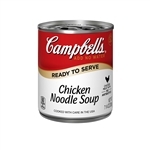 Campbell's Ready To Serve Easy Open Cream Chicken Soup 7.25 Oz. Campbell's Swanson Chicken Broth Soup 49.5 Oz. Campbell's Swanson Chicken Broth Soup 14.5 Oz. Campbell's Swanson Natural Goodness Chicken Broth Soup 49.5 Oz. Heinz Chicken Soup Broth - 49.5 Oz. Heinz Chicken Rice Soup - 49.5 Oz. Heinz Consomme Chicken Soup - 48 Oz. Heinz Cream Of Chicken Soup - 50.75 Oz. Unilever Best Foods Legout Cream Of Chicken Condensed Soup 50 Oz. Vanee Foods Condensed Cream Of Chicken Soup - 50 Oz. Buy wholesale Bulk Chicken Soups for restaurant applications such as buffets and soup bars as well as used to make custom sauces and dishes.